It is so much fun to be starting a wonderful new week! David has been in Florida visiting Mayberry Training Center looking at the newly turned 2 year olds for the last several days. He is returning to KY soon and will be able to spend time with ME again. (My Team is always on the job monitoring ALL of us…no matter what state we are residing in at the time.) Sarah had a nice weekend off…so well-deserved…and she is back on the job today. Charles and Donna and all of my Lane’s End Friends have been here with me….sharing all of the current news. MY CA TEAM is doing well and working away with all of my Barn 55 Friends. It is so much FUN when you LOVE WHAT YOU DO…and they are having a GREAT TIME…enjoying ALL OF US! Recently, I showed you the prototype for Nina Kaiser’s BRONZE of ME! Well, Nina and her friend, Karol BalIard, did a YOU TUBE showing how I MEASURED UP! As I’ve mentioned before, NINA spent a great deal of time doing ALL of my measurements and taking photos of every single INCH of me before I left CA! As a sculptor, she wanted to be completely prepared to be able to recreate MY BODY IN PERFECT SCALE. In the YOU TUBE…you see her doing some of this ‘homework’ for my BRONZE. She sent it to Dottie this morning for all of us to share! Enjoy…and the song is too cute as well! Happy Monday…and YEAH…MY SECRETARIAT AWARD on Saturday…and SUPER BOWL on Sunday! I just feel this is the start of a GREAT WEEK! Hi Zenyatta. I loved the video and “I am in Heaven”. It fit you so perfectly, angel in disguise. Wow, you are so awesome. I have seen you many times but you will always amaze me – you are unbelieveably beautiful. I also watched you as hip number 703 – you were very vocal letting everyone know that you were going to be a star. I am hoping the sculpture will be displayed at either Hollywood Park or next to John Henry, Seabiscuit at Santa Anita. It will be a sculpture for the ages, an unveiling that I will definitely be at. Love you, stay toasty and have much fun with your BBFs and your first date with Bernardini. Love you always. Wow, Zenyatta! By those measurements, you are sure a big girl but beautiful! Luv you! Just read a great article about you (Lessons From Zenyatta on the Review). What you have given us (your adoring fans) is truly priceless. You have taught me so many lessons..I strive to be a better person with your influence. Give it your all even when all odds are against you (like at CD), always be considerate of others (as you displayed throughout your career), love with all your heart (Mario, John, Dottie, the Mosses, THE FANS!!). Can’t wait to see your sculpture at Santa Anita. It will be at Santa Anita..right?? SANTA ANITA FEB 5. Too Cute, the Wells Fargo Banks in Malibu, Santa Monica, and Sherman Oaks, all gave me 1 of their ponies (stuffed!) to give to the Ladies Lounge. Zenny you are so Blessed and so is your family. May you be together forever. Hi Zen….love the bronze of you. Will have to start saving all my pennies to get one of those statues. But it would be worth every penny!! You are magnificent. And you are doing your dance. Hopefully TVG will show your Team Z accepting your award from Ms Penny. I am soo happy for you all. Z, so what do we discuss first? So many important dates for you. OK, first you have your award this weekend. The first ever SECRETARIAT AWARD~THE VOX POPULI AWARD…THE PEOPLE’S CHOICE,presented by Penny, Secretariat’s owner! You are getting this award because you are the VERY BEST HORSE, like he was !! How very awesome is this!! I am sure there will be many more awards on the way! OK, with that being said. Then there is Mr. Wonderful,BERNARDINI…your date!! I just wanted to let you know that I have been checking him out on YOU TUBE. He is sooo handsome, I heard the word MAGNIFICENT used for him ! I believe it after watching his races, and then I watched a YOU TUBE video….BERNARDINI TRIBUTE, it was fantastic. I was so impressed with how REALLY handsome, he is, his coloring, his conformation, he has a beautiful head like you and something about his stance,looks so royal,looking at him made me feel this is truly a match made in heaven. HI Z! Just wanted to say being the son of a National Champion Jockey & seeing all the greats over the last 50 yrs, having favorites from Native Diver to John Henry besides you, that you Z are the Queen of my Heart & that you would have kicked all their aZZeZ! Forever grateful for all the Great memories Z!!! Oh Zen you are so loved by the whole world. Please keep yourself safe. 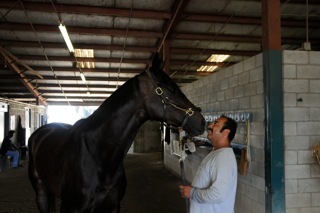 A word for Mario how lucky you are to have such a close contact with the greatest female race horse ever. Thank you for taking care of her. Love you Zen. Super Model Zenyatta. You are so beautiful outside and in and deserving of every good thing. So happy you are doing well at Land’s end and seem to be adjusting so well away from the track. I think you have a lot to teach us all about being content and happy in life. Thank you Team Z for sharing Zen with us. For the care and love you share with others! Brrr. Today I’m wishing I could be at Barn 55–it’s 22 here in central Texas with 40 mph winds. I’m SO thankful you have your winter coat now, and I pray that this storm bypasses Kentucky. Love you always, sweet Z. Good Morning Zenny ! What a sweet pic of you & Mario ! Back again this morning to see if we have a new diary entry, but not yet. Thanks to Suzanne G. for the link to Fran Jurga’s blog and the ESPN science lesson on Zenyatta’s stride. Very interesting, as is everything I am learning about our Queen. Thank you all! Beautiful Zenyatta, You are definitely the “IT” girl! Love the photo of Mario and you, again, just pure love. Also watched a video of Bernardini, my goodness, he is one good looking guy, and his floaty gait and balance makes me think he also a dancer. What a perfect match for you. Your offspring will either be another Dame Margot Fonteyn or Rudolf Nureyev. Loved the video of Nina and you too, such a good girl standing so regal and proud. My respect and love grows daily with the good works that come from you and your blessed family. Please tell Dottie that she definitely should be a writer if she chooses to change her profession and please send her a big thank you for her devotion to your fans. We love you so very much. I don’t know anything about this action and it doesn’t have anything to do with “Zenyatta” but it does have to do with Lane’s End so I thought I would post it anyway. I am so proud of you Zenyatta and can’t wait to see your foal..I wish you the best of happiness and health sweet girl…Love you Z…I love reading your diary.